Ulaganayagan Kamal Haasan is all set to make a huge announcement on his birthday, November 7. According to reports, Kamal will be floating his own political party on November 7, coinciding with his 63rd birthday. Kamal Haasan on Wednesday met members of his fans associations in Chennai to discuss activities to be carried out on his birthday on November 7. 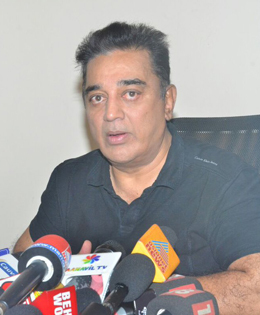 "We discussed welfare activities that we have planned for his birthday across Tamil Nadu," Thangavelu, Treasurer of the All India Kamal Haasan Fans Welfare Association, told the media in Chennai. He did not deny the possibility of the actor launching his political showtime on his birthday, stating, "He has already made it loud and clear that he will take the political plunge. As his welfare association, we are ready to support him in his journey." His reason for starting a new party is that none of the existing parties doesn't represent his beliefs. Haasan earlier told a TV channel, that his party will not be forged on the basis of either religion or casteism as he is against both of them. On Sunday, while talking at the inauguration of Sivaji Ganesan’s memorial, Rajinikanth said stardom in the film industry doesn’t usually ensure success in politics. However, he suggested Kamal may have what it takes to achieve his goals in politics. On film career front, Kamal is gearing up to release Vishwarropam 2. He is also expected to warp up Sabaash Naidu and Indian 2 before becoming a full-time politician.